You looking good would totally be an understatement. Hari Raya is a day for everyone. It is a day to look good and feel right about yourself. If you think that only women are allowed to look good on Raya, boy you're wrong. Calling all men out there, step up your game! Let’s see what’s up to the minute this Raya without having to worry about empty pockets later. Girls are suckers for guys in Baju Melayu. Bet this whole set of traditional Baju Melayu is what you’re looking for. It is made of Hybrita Cotton, which gives a classic touch to whoever is going for a classy look this Raya. Soft-coloured clothes could give the impression that you are an easy-going person. So why not try this Baju Melayu on Hari Raya? This high neckline set is relaxed fit and suitable to be worn throughout the day. Are you thinking of something different this year? Try this kurta in Salmon Pink by Mayasilk. Made of Italian crepe material, this kurta's contrasting sleeves and collar gives it a unique twist, making it far from ordinary. All my gym rats show some hands because we’ve got you the perfect Baju Melayu for Eid! This set from Fesyenku is a slim fit Baju Melayu so go ahead, flex those guns and show ‘em the result of all your hard work. Baju Melayu Johor is different from the usual ones in the market. It has a round neck, and the sampin is tucked below the top, which would come in handy for those who wish to hide their food baby from the rest of the world. Dare to be different? If the answer is yes, then this is the Baju Raya for you! 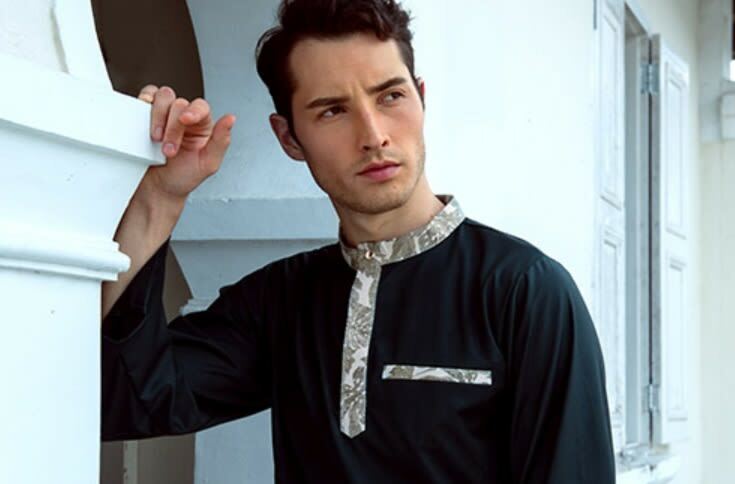 Unlike the usual plain ones, this Baju Melayu comes with diamond prints all over. You’ll surely be the talk of your kampong. Want to keep it simple but still make a statement? For obvious reasons, this red Baju Melayu will make you stand out from all your friends on Hari Raya. Its round neckline will give you the freedom to move around comfortably, too. We are loving this colour combination which abstains from the norm, giving its wearer a subtle hipster look. Wow the crowd by looking smashing in this piece. If you’re going for a bit of Arabic style this Hari Raya, go for a jubah. This jubah for men by Kamdar is available in sizes from XS to 3XL. So there’s always something for everyone. Baju Melayu made out of soft cotton is uncommon, but we found it! This piece will have you feeling easy breezy all-day long. Hence, meeting relatives and friends won't be too much hustle for you.